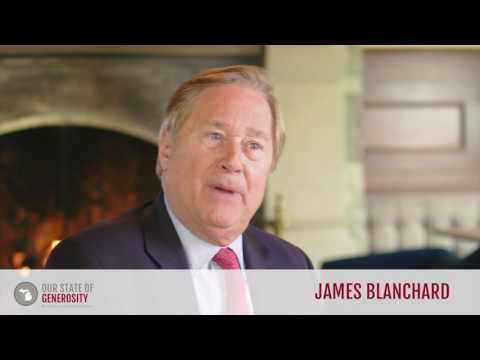 Michigan's 45th Governor, James J. Blanchard, boldly enabled legislation in Michigan to provide the first Tax Credit in the nation for smaller endowed donations to community foundations. An innovation to the previous Tax Credits for gifts to institutions such as public broadcasting, the Michigan Community Foundation Tax Credit assisted Michigan communities in raising permanent resources to meet local needs. A partner with Michigan's philanthropic community, Governor Blanchard demonstrated creative leadership on how state government can encourage private citizen engagement and investment in local problem-solving. His philanthropic leadership includes creation of new programs for youth, to service as a volunteer trustee on various boards, to providing his personal resources as a gift to recognize and encourage philanthropy and volunteerism. 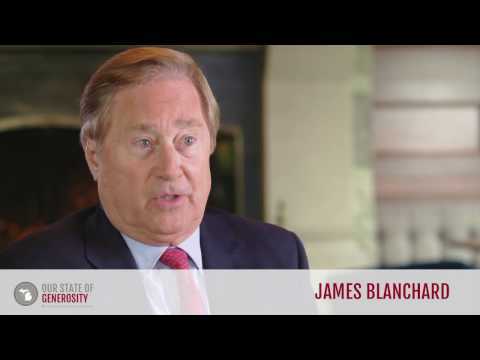 Governor Jim Blanchard talks about his career in philanthropy. Governor Jim Blanchard talks about how Michigan's state government collaborated with its non-profit sector in order to create the Michigan Community Foundation Tax Credit. Governor Jim Blanchard talks about how creating the Michigan Community Foundation Tax Credit was in the interests of Michigan and the nation. Governor Jim Blanchard talks about the impact George Romney, the 43rd governor of Michigan, had on Michigan's philanthropic sector. Governor Jim Blanchard talks about the selflessness of Michigan’s philanthropic leaders. 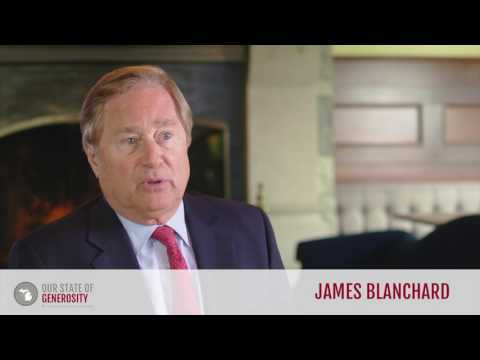 Governor Jim Blanchard attended Michigan State University where he earned a bachelor’s degree in Social Science in 1964, and his master’s degree in Business Administration in 1965. He went on to graduate with his juris doctorate from the University of Minnesota Law School in 1968, and was admitted to the Michigan Bar that same year. Governor Blanchard has served in various roles as a public servant throughout his career. Growing up in a family dedicated to service and activism, he saw early on the necessity of dedicating time and talent to those around him. He recalls his first encounters with service being through his church, when around Christmas time people could provide gifts of service rather than material gifts. His family’s interest in politics influenced him to eventually run for office, first for president of his class at Michigan State University, later as a member of congress, and eventually as Michigan’s 45th governor. While in office, Governor Blanchard was made aware of Michigan’s strong philanthropic presence by leaders Dottie Johnson and Russ Mawby. He demonstrated his dedication to service by working with these leaders, establishing Michigan’s first Office of the Great Lakes, creating the Michigan Youth Corps, and the Michigan Education Trust (MET). After serving two terms as governor, Governor Blanchard was appointed as the United States’ ambassador to Canada, for which he earned the Foreign Affairs Award for Public Service in 1996. Governor Blanchard went on to serve on various boards and as a director of the John F. Kennedy Library Foundation. For two years, the Council of Michigan Foundations (CMF) worked on legislation that would allow a gift to donors for their contributions to the permanent endowments of Michigan’s community foundations. In 1988, Governor Blanchard heard this call to giving and took action, signing the Michigan Community Foundation Tax Credit into law. The tax credit was vital in promoting the spirit of giving in Michigan; it inspired donors from households and businesses of all sizes to give to their communities and provided them with a tax credit based on what they were able to give. In its first year alone, the credit produced more than $2 million in funds that went directly to foundations all over Michigan. This increase in donations has had manifold effects, including the development of Venture Products Fund in 1995 to help support marketing efforts on behalf of community foundations needing new resources to promote their efforts (1). Although the tax credit was repealed in 2011 to help reduce the state’s budget deficit, its effects are lasting. Montana, North Dakota, Iowa, and Arizona have all instituted a tax credit for community foundations based on Michigan’s. This national influence proves the dedication of Governor Blanchard in promoting Michigan as a model state of generosity. Beyond his legislative work with the tax credit, Governor Blanchard worked tirelessly while in office to improve the economy, job market, and standard of living in Michigan. During his tenure, he instituted the state’s first Office of the Great Lakes, which promotes the health and wellness of the lakes surrounding the state of Michigan; the office improves the fresh water resources Michigan residents rely on constantly and helps harbor a healthy ecosystem for the animals that reside in the Great Lakes. During his administration, Governor Blanchard was challenged by leaders such as Dottie Johnson and Russ Mawby to recognize and act on Michigan’s unique and strong philanthropic presence. He responded to this call to service with the creation of the Michigan Youth Corps in 1983. The MYC employed 25,000 young people in its first year. Youth were presented with community-service oriented jobs, such as picking up litter and working in retirement homes. This program not only provided an opportunity for employment, but also instilled an element of service in the hearts and minds of Michigan’s youth. 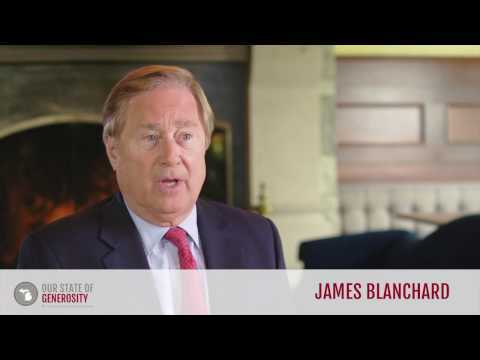 Beyond his work as a public servant while in office, Governor Blanchard has also recognized the value of private service, particularly through his alma mater. He has endowed both football and basketball scholarships at Michigan State University, but is most widely recognized for the creation of the Spartan Statesman Award for Distinguished Public Service. In 2015, he and his wife Janet donated $1 million to Michigan State University’s College of Social Science to institute the award, which is administered annually by the department of Political Science. The award, which includes the Jim Blanchard Public Service Forum, honors an individual who demonstrates outstanding public service. The award and lecture series serve as a way to involve and educate students about public service and provides students with an opportunity to engage with the most distinguished leaders the sector has to offer. Governor Blanchard served as Chairman of the Meridian International Center, a nonprofit organization with the goal of strengthening the United States and its leaders to become guides in meeting global goals to promote a positive future. He also serves as Vice Chairman of the National Archives Foundation, which encourages awareness of the country’s history and democratic processes (2). Governor Blanchard was interviewed regarding his insights and experiences working with Michigan’s philanthropic community and the Our State of Generosity (OSoG) partners. The following are selected quotations from his interview specifically related to the five organizing themes of the OSoG project.